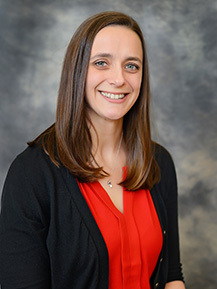 Laura Wysocki began teaching at Wabash College in 2011 and specializes in Organic Chemistry. Dr. Wysocki focuses on the synthesis and study of fluorescent dye derivatives that can be used as sensors or enzyme substrates. She has always been inspired by the interdisciplinary nature of science and enjoys working with undergraduates in her laboratory exploring new ideas. She has recently taught special topics courses in natural product synthesis and the chemistry of the pharmaceutical industry. She is also a visiting scientist at Howard Hughes Medical Institute’s Janelia Farm Research Campus. As a proud Wisconsin native, Dr. Wysocki loves living in the Midwest. When she is not in her laboratory or office, she enjoys supporting her students and colleagues across campus. She can usually be found cheering on her favorite sports teams, especially on the basketball court. March Madness is her favorite holiday. Ledford, B. A. *; Davis, J. D.*; Wysocki, L. M. Using a Polarity Assay to Characterize Rhodamine Derivatives. Poster Presentation at the American Chemical Society 247th National Meeting & Exposition, Dallas, TX, March 2014. Cloyd, R. A. *; McCauley, A. M.*; Wysocki, L. M. Synthesis and Testing of a Library of Fluorescein Diether Cytochrome P450 Substrates. Poster Presentation at the American Chemical Society 247th National Meeting & Exposition, Dallas, TX, March 2014. Wysocki, L. M.; Kitley, W. R.*; Santa Maria, P. J. *; Cloyd, R. A. * Versatile Synthesis of Fluorogenic Probes via a Leuco Fluorescein Derivative. Poster Presentation at the American Chemical Society 245th National Meeting & Exposition, New Orleans, LA, April 2013. Sullivan, R. L.*; Wintczak, D. W.*; Cloyd, R. A. *; Gunderman, P. R.*; Wysocki, L. M. Synthesis of Rhodamine B Derivatives and Their Analysis in Different pH and Polarity Environments. Poster Presentation at the American Chemical Society 245th National Meeting & Exposition, New Orleans, LA, April 2013. Tian, L.; Yang, Y.; Wysocki, L. M.; Arnold, A. C.; Hu, A.; Ravichandran, B.; Sternson, S. M.; Looger, L. L.; Lavis, L. D. Selective Esterase-Ester Pair for Targeting Small Molecules with Cellular Specificity. Proc. Natl. Acad. Sci. 2012, 109, 4756–4761. Wysocki, L. M.; Lavis, L. D. Advances in the Chemistry of Small Molecule Fluorescent Probes. Curr. Opin. Chem. Biol. 2011, 15, 752–759. Wysocki, L. M.; Grimm, J. B.; Tkachuk, A. N.; Brown, T. A.; Betzig, E.; Lavis, L. D. Facile and General Synthesis of Photoactivatable Xanthene Dyes. Angew. Chem., Int. Ed. 2011, 50, 11206–11209. Wysocki, L. M.; Dodge, M. W.; Voight, E. A.; Burke, S. D. A Stereochemically General Approach to Adjacent Bis(tetrahydrofuran) Cores of Annonaceous Acetogenins. Org. Lett. 2006, 8, 5637–5640. Han, Y.-J. ; Wysocki, L. M.; Tanawala, M. S.; Siegrist, T.; Aizenberg, J. Template-Dependent Morphogenesis of Oriented Calcite Crystals in the Presence of Magnesium Ions. Angew. Chem., Int. Ed. 2005, 44, 2386–2390. Wysocki discusses the joys of the laboratory and her proximity to the Nobel Prize.